Time is fleeting and days roll by like road signs on a freeway. Moments consisting of only a glimpse, a stare, are gone as fast as they arrived. We are counting down days as this weekend rapidly approaches. Tuesday Jacy readmits herself for another round of chemotherapy. 5-7 days hospital bound. So this weekend is all about family. Cody is home and all of the kids have been pestering him, hoping for one on one time with their older brother. To Cody’s credit he has taken the time, spending it carefully with each one of them, letting them do what they want to do and fostering a fun, over the top attitude. We are proud of this boy, he went off to college and came back just a tad bit grown up and is becoming one heck of a man. Counting and counting, days, hours, minutes and seconds. One more day till chemo, many more days till total sickness, and a few more days until blood transfusions; then just as you start to feel like yourself again, hives! Or headaches, or difficulty breathing, or the inability to stay awake because you need Benadryl for the hives, or blood transfusion or because you just need to sleep. Once all of these medical cocktail concoctions are hammered out, it is time to throw in a Bone Marrow Transplant. Speaking of a Bone Marrow transplant, we learned on Thursday of this week a match had been located, identified, notified and accepted! Not just any match mind you either, this match was a 10 out of 10!!! Pretty super great news! Some really awesome person took the time to get swabbed and now will inevitably change the course of both their life and my wife’s forever! Thanks to this angel, Jacy now has the best recovery chances yet! In case you were wondering or asking yourself right now; what does ten out of ten really mean? 10/10 is part of HLA matching for a suitable donor and here is everything you need to know about matching and the importance of that donor via my favorite web site: Be The Match! Human leukocyte antigen (HLA) typing is used to match you with a donor for your bone marrow or cord blood transplant. This is not the same as ABO blood typing. HLA is a protein – or marker – found on most cells in your body. Your immune system uses HLA markers to know which cells belong in your body and which do not. Be The Match Registry® is a listing of potential donors and cord blood units and their HLA types. The best transplant outcome happens when a patient’s HLA and the donor’s HLA closely match. Half of your HLA markers are inherited from your mother and half from your father. Each brother and sister has a 25%, or 1 in 4, chance of matching you, if you have the same mother and father. It is highly unlikely that other family members will match you. Under very rare circumstances, family members other than siblings may be tested. About 70%, or 7 out of 10, patients who need a transplant do not have a suitable donor in their family. If you do not have a donor in your family, your transplant team may look for an unrelated donor or cord blood unit for you on Be The Match Registry. When a search is done on the Be The Match Registry, it includes a search of more than 22.5 million potential adult donors and more than 601,000 cord blood units on lists from around the world. Increases the likelihood of a successful transplant. Improves engraftment—when the donated cells start to grow and make new blood cells in you. Reduces the risk of complications after transplant, especially graft-versus-host disease (GVHD). GVHD is a potentially serious complication. GVHD occurs when the immune cells, which are part of the donated marrow or cord blood, attack your body. There are many HLA markers. Each HLA marker has a name. The names are letters or combinations of letters and numbers. Doctors review at least 8 HLA markers for these minimum requirements: two A markers, two B markers, two C markers, and two DRB1 markers. Some doctors look for an additional marker, called DQ, to match. An adult donor must match at least 6 of these 8 HLA markers. Many transplant centers require at least a 7 of 8 match. Because cord blood cells are less mature than adult donor cells they have less strict matching criteria. A cord blood unit must match at least 4 of 6 markers at HLA-A, -B, and -DRB1. These guidelines are based on scientific studies of transplant results. Example A shows that the patient’s markers match the donor’s. When HLA markers A, B, C, and DRB1 from the patient and the donor match, it is called an 8 of 8 match. When A, B, C, DRB1, and DQ markers all match, it’s called a 10 of 10 match. Example B shows that one of the patient’s A markers does not match one of the donor’s A markers. Therefore, this is a 7 of 8 match or, if the DQ marker matches, a 9 of 10 match. HLA typing is a complex process that can be done at different levels of detail. Patients always have HLA typing done at a high level of detail. Blood is tested using laboratory methods that check the exact HLA markers. Every potential donor has a special type of detailed HLA typing (also called confirmatory typing) done before being chosen as the best match for a patient. Confirmatory typing is done to make sure the patient and potential donor match at a detailed level. HLA matching is the most important factor but not the only factor that can affect your chances of having a successful transplant. The number of blood-forming cells needs to be suitable for the size of the patient. Larger patients need more blood-forming cells. Cord blood units have fewer cells than adult donors. Sometimes, more than one cord blood unit is needed for a patient. If more than one well-matched adult donor is found for you, your doctor will look at these factors. Infection history can also affect transplant outcomes and choice of a donor. Before transplant, doctors test patients and donors for a common virus called cytomegalovirus (CMV). Transplant centers may face a greater challenge finding a match for some patients because some HLA types are less common. HLA types are inherited, so the best chance of finding a suitable donor may be with someone of a similar racial or ethnic background. Some people have very diverse tissue types that reduce the chances of finding suitably matching donors. You can see how a “10 out of 10” match is pretty darn great!!! We also learned the tentative date for her transplant is scheduled for the 22nd of June. Then things get turned a little further upside down here on the ranch. We as a family had a long talk about everyone’s responsibilities while mom was away this summer. Three months is an eternity in a child’s mind and that time frame really hit Parker hard. Through a few tears and a lot of hugs he came to realize the importance of mom’s latest adventure, and even though he didn’t like the idea, he agreed to be the best strongest little dude he could be. I cannot imagine being a young guy trying to process all this information in conjunction with your mom declaring she will be absent for the entire summer. Other than one small emotional blip, everything else seems to be coming together just fine. We all know our roles, and Jacy know hers is to do nothing more than heal, get better and come home to her family. Only time will tell what our summer brings.. Previous postA Mystery is afoot! Excellent news about the match. My thoughts and prayers continue for you and your family. You all must be so proud of the strong family unit you have created. 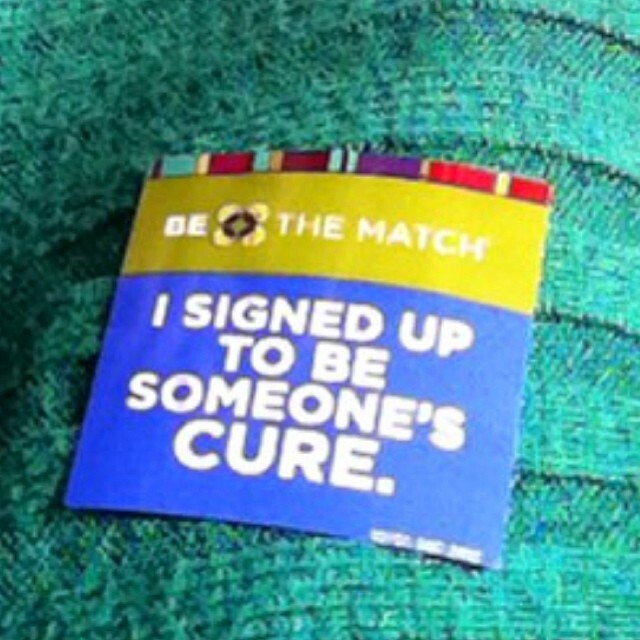 I have been on the bone marrow registry for almost 16 years. I have unfortunately never been a match. Hopefully one day. FANTASTIC NEWS!!! Prayers have been answered….Thank You Lord! Now the prayers go up for your whole family during the summer and for Jacy’s procedure and healing. God bless the donor!! Congratulations on finding a match! This is wonderful news. I will pray the chemo and transplant are successful and result in a cure for Jacy. I also pray for you and your children during all of this. Three months is a long time to be away from a spouse or parent but if this gives her the best chance at a cure then it will all be worth it. I know how hard it’s been to have my husband away for almost a month. He just got released from the hospital on Tuesday after completing his induction treatment. It was successful and we will have our first follow up next Wednesday to see where we are and what the next course of treatment will be. Thoughts and prayers for you and your family.